From the rocky North Shore cliffs, Split Rock Lighthouse guided freighters safely across the stormy waters of Lake Superior for half a century. In the early years of the 20th century, Lake Superior was experiencing a high and growing demand for iron ore shipments. With 112 steel freighters in 1901, U.S. Steel Corporation bulk ore carriers became "the greatest exclusive freight-carrying fleet sailing under one ownership in the world." The call for a new lighthouse on the lake’s inhospitable North Shore was hardly surprising. On November 28, 1905, a single storm damaged 29 ships, fully one third of which were the uninsured property of the U.S. Steel fleet. Two of these carriers foundered on this rocky coastline. As American novelist James Oliver Curwood proclaimed, the North Shore of Lake Superior was "the most dangerous piece of water in the world." Led by the U.S. Steel company president, a delegation descended upon Washington, D.C. to lobby for a light station. Originally known as Stony Point, the name Split Rock was first used by the lobbyists when describing the location, and the name stuck. 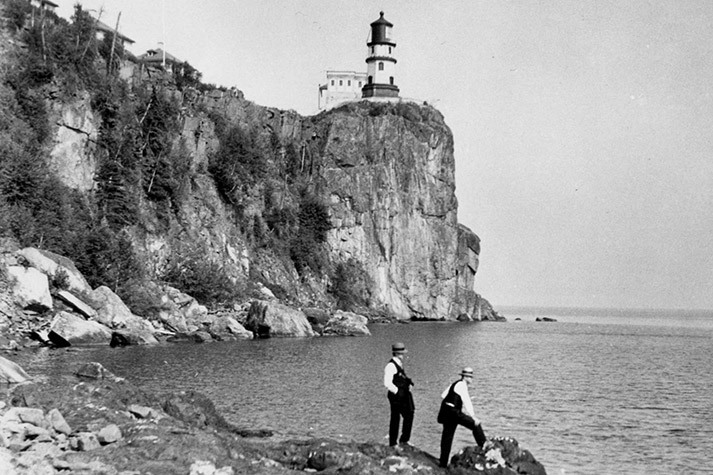 In early 1907, Congress appropriated $75,000 for a lighthouse and fog signal at Split Rock. 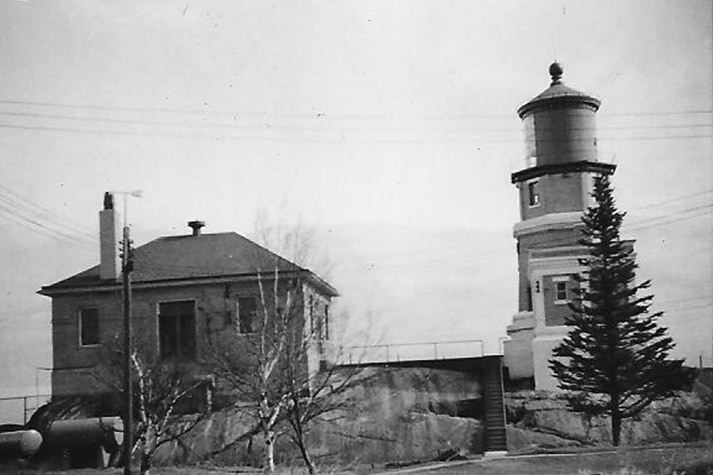 The U.S. Lighthouse Service completed construction of the 7.6-acre facility in 1910, and Split Rock Lighthouse was born. When Split Rock Light Station was commissioned in 1910, all beacons in the United States were under the authority of the U.S. Lighthouse Service (USLHS), a branch of the Department of Commerce. In 1939, the USLHS was absorbed into the U.S. Coast Guard, which continues to operate all lighted aids to navigation in the United States today. 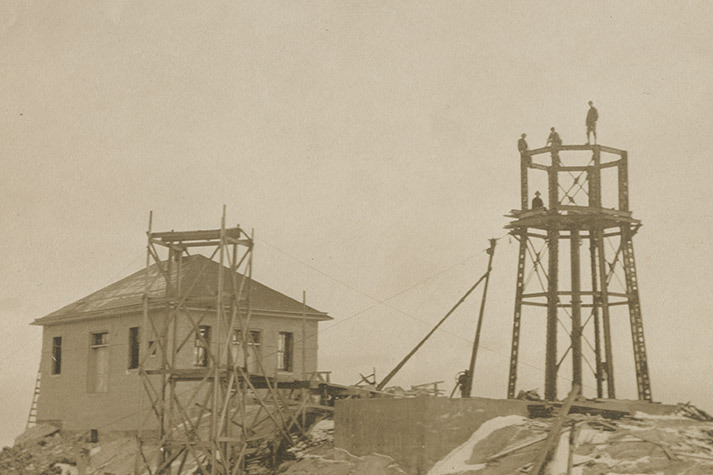 The lighthouse could only be accessed by water for nearly 15 years until the Lake Superior International Highway was completed in 1924, making the lighthouse more easily reachable for the lighthouse keepers and their families. Tourists also took advantage of the new roadway, and Split Rock Lighthouse swiftly became one of the most popular destinations in Minnesota. About 5,000 people visited the lighthouse each year in the early 1930s. By 1938, keeper Franklin Covell estimated nearly 100,000 visitors to the site. This gave Split Rock Lighthouse five times as many visitors as any other station in the service. When the Coast Guard absorbed the Lighthouse Service in 1939, it publicized Split Rock Lighthouse as "probably the most visited lighthouse in the United States." As new navigational technology, such as Long Range Navigation (LORAN), radar, and Global Positioning System (GPS), began to emerge, the use of lighthouses as a navigational tool declined. 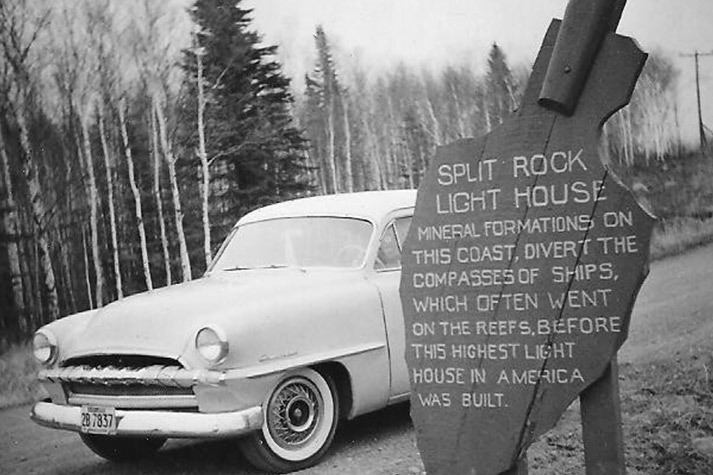 Split Rock Light Station was closed in 1969. There are only five staffed light stations in operation today. All other lighthouses in the United States are either automated or decommissioned. The State of Minnesota obtained the historic and scenic landmark in 1971 and transferred administrative responsibility for the 25-acre Split Rock Lighthouse historic site to the Minnesota Historical Society in 1976. The historic site has been restored to its early 1920s appearance, a time when the isolated light station was accessible only by water. Each year, thousands of visitors stop at the lighthouse and visitor center to learn about the history of this Minnesota icon and take in the beauty of the Lake Superior shoreline. Split Rock Light Station was designated as a National Historic Landmark in 2011.